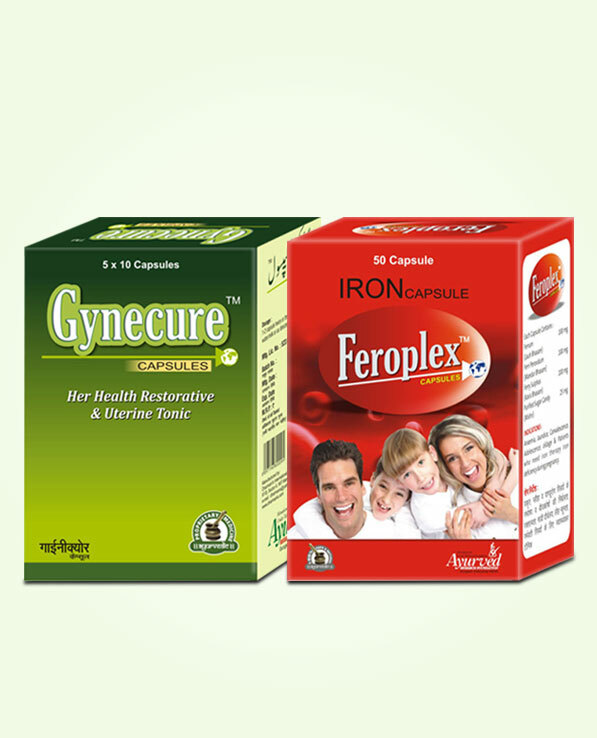 Gynecure and Feroplex capsules are wonderful herbal supplements for women who face problem of irregular or painful periods. Gynecure capsules possess herbal ingredients which remove disorders and problems which hinder regular arrival of menstrual cycle and smooth bleeding days. These also regulate amount of bleeding and prevent scanty or too much flowing periods effectively. Irregularities in periods can be hazardous for a woman’s fertility and can pose problems in conceiving and carrying on pregnancy. These also harm a woman’s emotional status and can lead to irritated behaviour, mood swings, poor focus, etc. Feroplex capsules are energy boosters and cure debilitating disorders like anaemia. Lesser red blood cells in the body which deplete haemoglobin levels and cause anaemia are primary reasons of menstrual irregularities, and cramps and pain. Gynecure and Feroplex capsules are wonderful supplements to treat and relieve discomfort caused by these health issues during menstrual cycle and provide health and improved fertility to a woman. Regulate menstrual cycle and ensure timely arrival of menses. Curb pain and discomfort during periods. 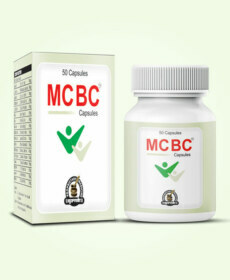 Prevent scanty periods or excessively flowing periods. Prevent delays in menses and maintain their healthy frequency throughout the year. Improve health of uterus and other reproductive organs. Maintain healthy hormonal balance and secretion of vital hormones in optimum quantity. Curb mental disorders like irritated mood, mood swings and poor focus, etc. Curb disorders like sleeplessness during periods and provide sound and restful sleep. 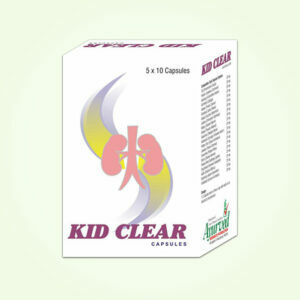 Prevent urinary disorders and irritations in genital area. Enhance fertility and health of a woman considerably. Supplement iron in bio-available form to remove iron deficiency from the body. 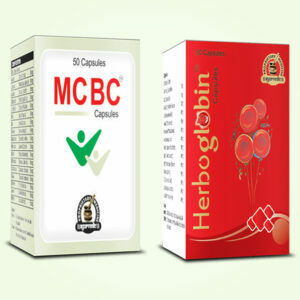 Increase number of red blood cells in the blood and improve level of haemoglobin quickly. Improve blood’s nutrient carrying capacities. Energize all the organs of the body and enhance flow of blood towards female’s genital organs. 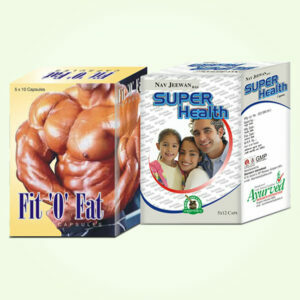 Improve nutrition and oxygen supply to all the organs of the body including reproductive organs. Improve energy levels and delay process of aging by supplementing anti-oxidants. Strengthen musculoskeletal system and improve liver and spleen functions. Curb disorders like fibromyalgia, osteoporosis, etc. efficiently. Gynecure capsules come loaded with herbs like Lodhra, Ashok, Kasani, Samudraphal, Mochras, Shwetbi, Morpankhi, Menphal, etc. which collectively provide various health benefits. These herbs enhance secretion of estrogen and progesterone hormone in female body; these hormones improve formation and shedding of uterus lining at regular intervals to prevent irregularities of menstrual cycle. The herbal ingredients of these capsules prevent muscular spasms and abnormal uterine contractions to curb pain and cramps during periods. These also maintain healthy bleeding and prevent scanty or heavily bleeding periods. These maintain health and nutrition of entire female reproductive system and prevent dryness, allergies and infections in female genitalia very effectively. 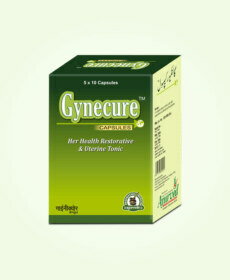 Gynecure capsules enhance energy levels and also provide calm and relaxed mind by promoting healthy hormonal balance. These cure disorders like stress, fatigue and lethargy and also mood swings and irritated mood, etc. These bring sound sleep and allow body to reenergize for next day. These capsules possess herbal ingredients which enhance flow of blood all over the body and enhance nutrition and oxygen supply to all the organs. Gynecure capsules can show their positive results in women of all ages and prevent side effects of menopause as well considerably. These prevent tissue damage due to free-radicals and lower toxicity level. These are also very useful for boosting-up female’s immunity. Feroplex capsules are iron supplements; these possess herbs like Lauh, Kasis Bhasma, Mandur Bhasma, etc. and supplement iron in bio-available form to get easily absorbed in the body. Iron deficiency is source of many disorders including scanty, heavily flowing painful periods and irregularity in date, and cramps during periods. 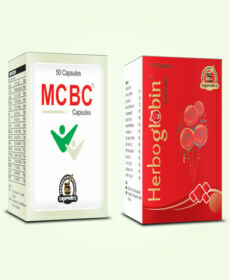 These capsules ensure that iron gets absorbed in body without throwing stomach functions off balance. Major part of the iron gets absorbed in bone-marrow and increase number of RBCs in blood and increase level of haemoglobin. Higher haemoglobin means more nutrition and oxygen to cells of the body and stronger and enduring organs. Optimum iron supplementation also improves liver and spleen functions and keeps health sound and upbeat. Iron prevents other disorders too like osteoarthritis, polymyalgia, fibromyalgia, osteoporosis, restlessness, poor focus and irritated mood. These disorders are commonly found in women due to menstrual irregularities. Feroplex capsules enhance functions of reproductive organs and maintain higher energy levels in the body and prevent fatigue and lethargy. Gynecure and Feroplex capsules are easy to use, simply consume one or two pills of these regularly twice in a day after breakfast and dinner with water for at least 3 to 4 months. These herbal supplements are safe for even prolonged use and woman of any age can use them without any fear of side effects. These do not contain any synthetic or harmful material and show their positive results in a short time. I tried these supplements and they really worked. Those women who are suffering from irregular periods must give a try as these pills are purely herbal. Great combo to cure painful periods and regulate menstrual cycle! Would order more! Love this stuff. Helped me with the energy level and mood elevation.